If you have a need to hear sounds coming from your Windows Server 2008, you'll need a sound card or motherboard with sound support, then simply follow steps 1 and 2 below, and you're all set. A far more likely scenario would be for you to want sound support for your RDP connection (aka, Remote Desktop Connection, aka Terminal Services). This can be useful, say for hearing your largely "head-less" server console, should software be beeping to get your attention. I found bits and pieces of the steps required to get server variants to do the basic level of multimedia. I've now pulled it all together for you here, 10 simple steps, screenshots not really required, but video below if anything trips you up. 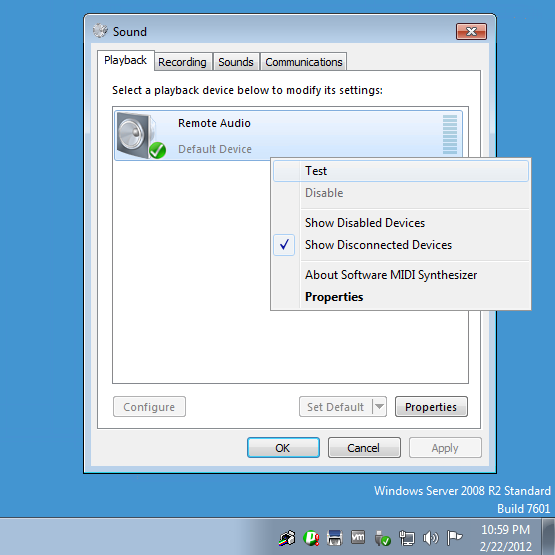 Now on your Windows Server 2008 remote desktop, click Start, type mmsys.cpl and hit Enter, right-click on the "Remote Audio" device and choose Test, and you'll hear sound, that's it! You are now all set, even after rebooting, you'll now have sound. You may also notice that when you use RDP to login after a fresh reboot, you may notice the subtle Windows Startup sounds.